Bullseye competitor shoots Colt 9mm 1911 for Center Fire part. At end of 1800, round wanted to stick in the chamber. [Rounds all were headspace measured and even stuck round was ok.] Seems desirable to clean the chamber at end of slowfire without taking the pistol apart. All available brushes are too long to fit through exit port even if one could attach something like old Hoppes short, flexible rod. Snake is good, but something better must exist that works well on the chamber. So: a short 9mm brush connected to a rod bent about at right angle to axis of brush might be the ticket. Ideas please. Details. That is what I do with my Benelli .22LR. At the end of 30 rounds of slow fire, I use a 6mm brush, bent at a 90 degree angle, and give the chamber a quick cleaning. If I don't, I may (or may not) experience failures when I hit the 80+ round mark. I have gone as much as 120 rounds without a failure, but to be safe I shoot 30, brush, then 60 rounds sustained fire with no problems. I saw someone at a match with a 7" cleaning rod with a "T" handle. He put a brush in the ejection port with the screw end facing the muzzle screwed it on the rod and pulled the brush through. You could pull the brush into the chamber and give it a few twists and push it back into the port verses pulling through the barrel. If all you want to do is the chamber try a .40 brush. You can use a piece of weed trimmer cord as an empty chamber indicator, and tie a loop on the end. Inserted so that the loop sticks out the muzzle, a moderately tight fitting cleaning cloth moistened with Kroil (or the solvent/oil of your choice) can be pulled from the chamber end prior to the next stage of fire. This will clean the chamber between stages. These might be long enough to bend in the middle. I've never heard anybody call a Colt barrel tight chambered. I have to suspect something other than that. What powder is being used? I use WSF and never have any residue even after 200+ rounds. Very clean. Maybe run some factory rounds and see what happens. Both my Kart and KKM barrels are short chambered and if the bullet is long that will cause problems. Colt barrels are not usually short but one could use the wrong o.a.l. and cause problems. I've seen stickiness from bullets being slightly canted when seating causing hard to chamber rounds. I had to slow way down and verify the bullet is PERFECTLY square on the brass. No more problems. Thanks for the several suggestions. I will digest. 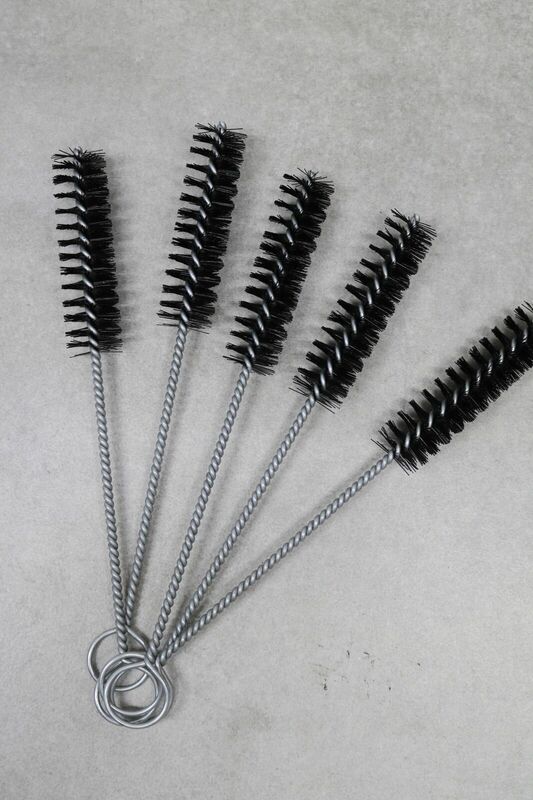 Indeed, a bent in about half regular bore brush should be a help in cleaning chamber. Easy to experiment with. However, robert84010 brings up issues that need to be checked. The powder used is WSF and HAP bullets. Every cartridge is checked with a headspace gauge. However, the chamber of the Colt barrel has not been "gauged." Need to remove barrel and attempt to discover if the issue is with cartridges. I bought a package like this 20 years or more ago and still using them. Great for that hard to get at spot and quick clean without being abrasive. They come in different sizes but they squish down a lot if you need to. Test tube brushes. Anyone actually take the gun apart and LOOK at the chamber rather than just running a snake down it? Was the gun actually well cleaned before the match and is the chamber in good condition? How about the feeding and function? What condition is the extractor and is it fit correctly? Anyone inspect the ammo? Is it reloads? Use a chamber checker on them? I don’t expect an answer to every question, as there would be a loooong list if I asked everything you could ask, but there is a lot more to examine than just a dirty barrel. If the gun can’t make it through a short match, then there may be deeper problems than just needing to swipe the chamber. To throw another idea out there: I've taken to polishing the chamber of my barrel. It has helped feeding considerably. The barrel has to be removed before polishing, so it's not a really quick fix. But, polishing the chamber by hand - and I use q-tips with MAAS metal polish - can't hurt (IMO). I started doing this to extend the number of rounds between cleanings before a feeding or extraction problem occurs because of my Powder Puff loads and low strength recoil spring. If you need a cleaning rod with a T handle get the Lewis lead tool.. I use the rod that comes with it quite a bit. In reverse order: I have learned about "Brush Research" hones - very interesting, but rather more aggressive than what I am comfortable with in barrel chambers. However, have used metal polish on q-tips several places - lots of work, but work-piece does not get-away from one. Parts of Glocks and several ramps need the polishing. When I get the 9mm Colt from competitor, I will sure polish the cartridge's path. Thanks. So far, reloaded cartridges seem to be fine - WSF, HAP and WIN cases. However, the sticky cartridge has a base that looks "old." Indeed, the whole system needs to be given a good viewing. Love the idea about test-tube-brushes. Just the sort of device competitor can use - after I fix the actual issue - to have confidence. Many years ago, I designed and crafted a device that required little from the user - who promptly complained. Oh, said I, I have yet to install the "push-to-use" button, which went to nothing, but made the user very happy. Today, I would add a LED light. Thanks all. Many Rifle builders use them to final polish the chamber and throat of new barrels. You really would have to work hard to change any dimensions with them as they as designed for final finish unlike solid hones which will straighten holes. they also do great on firing pin holes extractor holes and slide upper lug area. I've used them for years without any issues at all.